A spectator at a car rally at which a woman was killed has said marshals had earlier told onlookers to move. 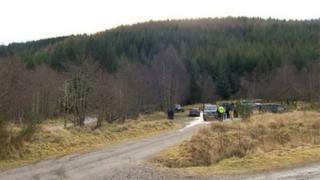 Gordon Sutherland said he was standing 10m away from Joy Robson, who died when a car lost control at the Snowman Rally in Inverness in February 2013. He said he "didn't feel completely safe" and was about to change position when the crash happened. Mr Sutherland, 53, said marshals had earlier told other spectators they should move. He said he thought the officials were proactive and were "doing their job correctly". Mr Sutherland, from Thurso, also told of helping to lift the crashed car to rescue a a boy, who was trapped beneath the vehicle. Also giving evidence, a doctor, James MacHugh, said he reached the scene by car in 14 minutes but was slightly impeded by spectators along the route. When he arrived Mrs Robson had been moved from beneath the crashed car and was already receiving CPR. Annie Butterwork, who has attended rallies since childhood, told the inquiry how she would always stand back above road level and expressed surprise at the number of people next to the track that day. The 23-year-old told how moments before the crash, a marshal suspended action when a group of spectators refused to come off the road - and how prior to that another car had to brake suddenly when a teenager crossed directly in front of it. Also giving evidence, her brother Gavin - a former firefighter - told how he was "exhausted" after helping perform chest compressions on Mrs Robson for a quarter of an hour before an event doctor arrived. He described earlier seeing a yellow car spinning airborne where spectators had been. A joint fatal accident inquiry is being held into death of Mrs Robson, 51, from Skye, as well as the deaths of three people - Iain Provan, Elizabeth Allan and Len Stern - at the Jim Clark Rally near Coldstream in the Borders in 2014. The hearing in Edinburgh heard evidence on Thursday from Mrs Robson's son Dean, who told of the moments leading up to his mother's death.